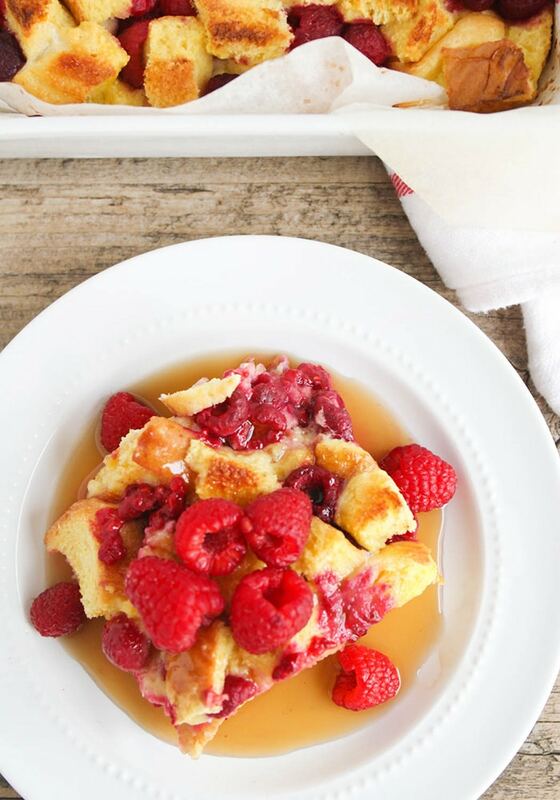 This easy and filling baked raspberry french toast is bursting with juicy berries and so delicious. Perfect for a special breakfast or brunch! I’ll admit it: I’m not really a breakfast person. I love breakfast food, but I’m usually so tired in the morning that I just make cereal or toast and yogurt for breakfast, and don’t bother with anything fancy. On the weekends, though, we love having a leisurely breakfast with the whole family, and that’s when I get to try out delicious breakfast recipes. I’ve been making baked cinnamon french toast for a few years now, and it’s always a hit with the family. 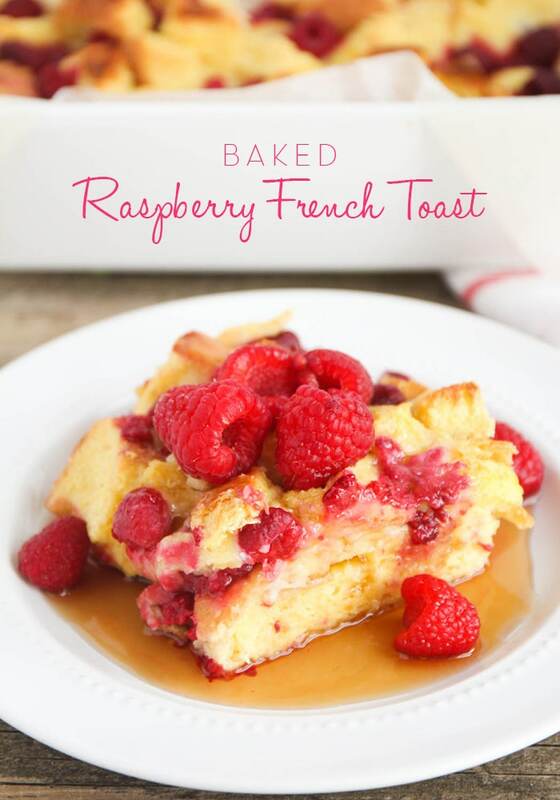 This time I wanted to change things up, and came up with the idea for this delicious baked raspberry french toast. I think my family liked it even better than the original version! As much as I love my previous overnight version, I like that this recipe doesn’t require the same planning ahead. I mixed it up in less than ten minutes, and it was ready in about an hour total. I think it helps to use a soft sandwich bread that soaks up all of the yummy sweet egg mixture. I was a little nervous about using frozen raspberries, but they worked great! 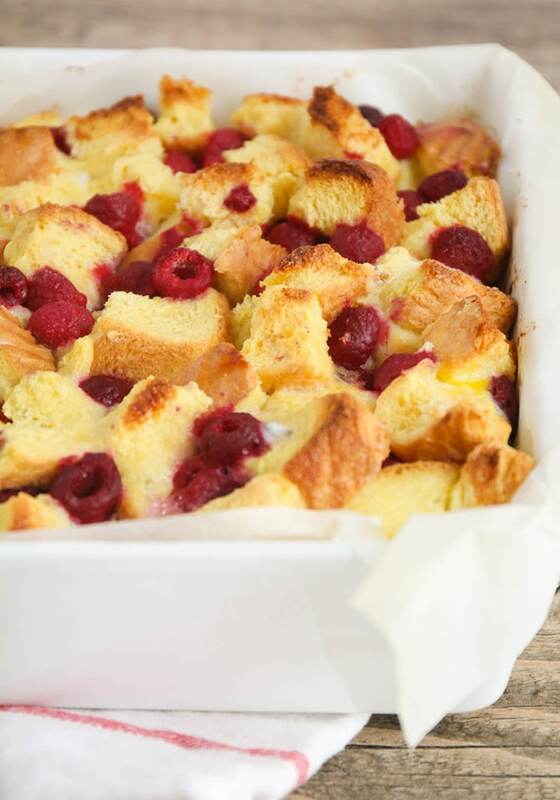 I love the contrast of sweet eggy bread and juicy, slightly tart raspberries. Because I have a major sweet tooth, I poured maple syrup over my french toast, but you could definitely leave it out if you’re not as into sweets as I am. Either way, it’s a delicious and easy breakfast! Preheat the oven to 400. Prepare an 8 x 8 baking dish by lining with parchment or spraying with cooking spray. Add half of the bread cubes to the prepared baking dish. Toss the raspberries with one tablespoon sugar and the flour. Sprinkle 2/3 of the raspberries over the bread cubes. 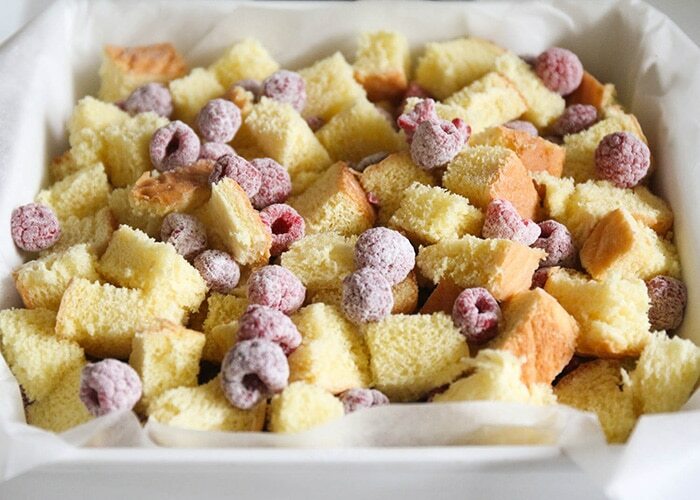 Top with remaining bread cubes, then remaining raspberries. In a small bowl or measuring cup, whisk together the eggs, milk, half and half, vanilla, and 1/4 cup sugar. Pour the egg mixture over the bread cubes, distributing evenly. Bake 45-55 minutes, or until the french toast is golden brown on top and springs back when touched lightly. 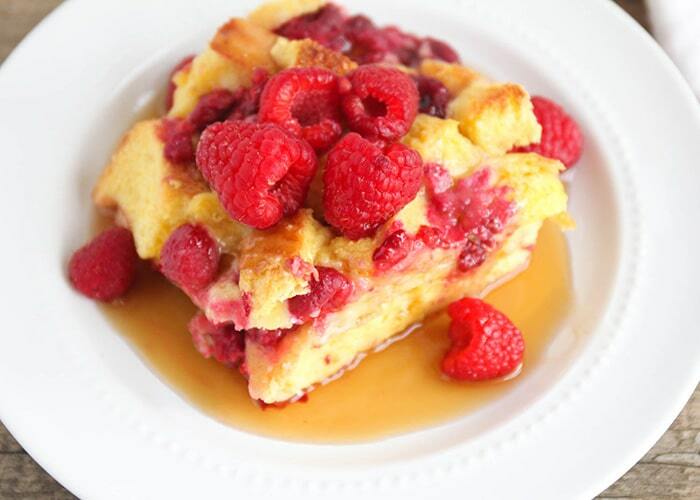 Serve warm with maple syrup and fresh raspberries, if desired.